I have already read Damasio's 2003 book, Looking for Spinoza: Joy, Sorrow, and the Feeling Brain, and while it was interesting to read this book, published in 1994, it does not add to what the later book contained, the later book travels further and I preferred the more philosphical style of the more recent book. The strength of this particular book is its painstaking accumulation of evidence, which for some readers will be what they most desire, but for others will appear dry [though in fairness, his clinical case studies are fascinating and more than slightly disturbing]. 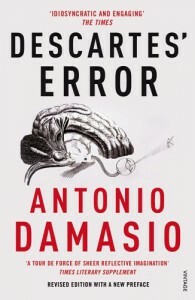 I have long felt that Damasio's account of the embodied nature of our minds, his materialist account of human consciousness, is superior to any other that I have read, and for this I recommend going straight to Looking for Spinoza.